Jessica joined Mello & Pickering LLP in January 2015. In 2011 Jessica received her undergraduate degree from Saint Mary’s College of California where she majored in political science. After graduating from Saint Mary’s, she received her law degree from Thomas Jefferson School of Law in 2014. She was then admitted to the California State Bar in December 2014, after passing the state bar exam on her first attempt. 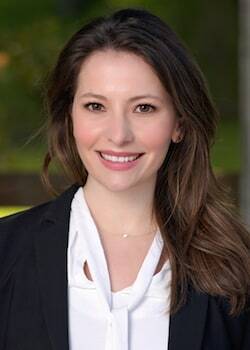 During her law school education, Jessica gained extensive experience in family law working for the Department of Child Support Services, the San Francisco Bar Association’s family law project and a solo family law practitioner. Jessica’s hard work in law school earned her a place on the honor roll and distinguished honor roll during her last three semesters. She also earned the CALI excellence award in Immigration law. Jessica developed a passion for family law early on in her law school career. However, it was while working with SF Bar Association that she determined she would pursue a career in family law. There, she worked hands on with low-income clients whom she had the opportunity to guide through the very beginning stages of their divorce and custody cases. Having seen the emotional toll that family law matters can take on clients, Jessica’s primary goal is to always make her clients safe, well represented and hopefully worry a little less knowing she is working hard to represent their best interests. When not working, Jessica enjoys spending time with her family and friends, cooking and traveling.